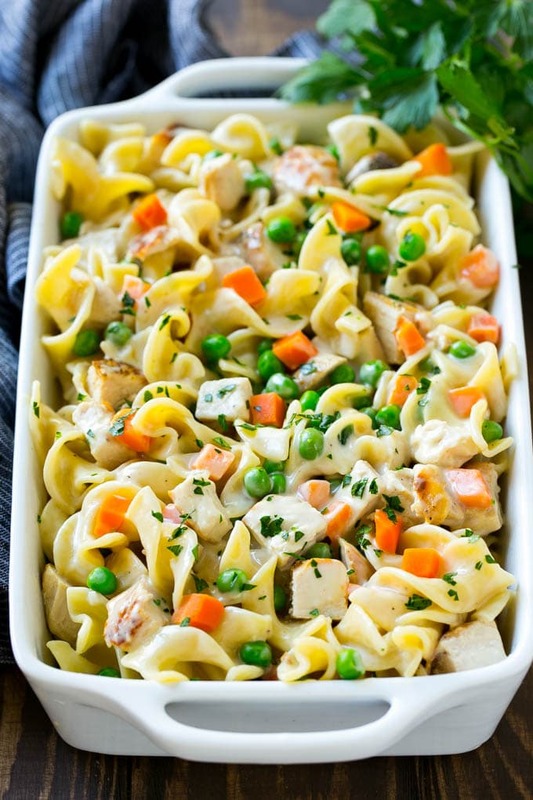 This easy chicken noodle casserole is a complete meal in one pan with chicken, veggies and egg noodles all baked together in a creamy sauce! An easy dinner the whole family will love. There are days when you want to be virtuous and eat a vegan salad for dinner, and there are other days when you’re craving comfort food. 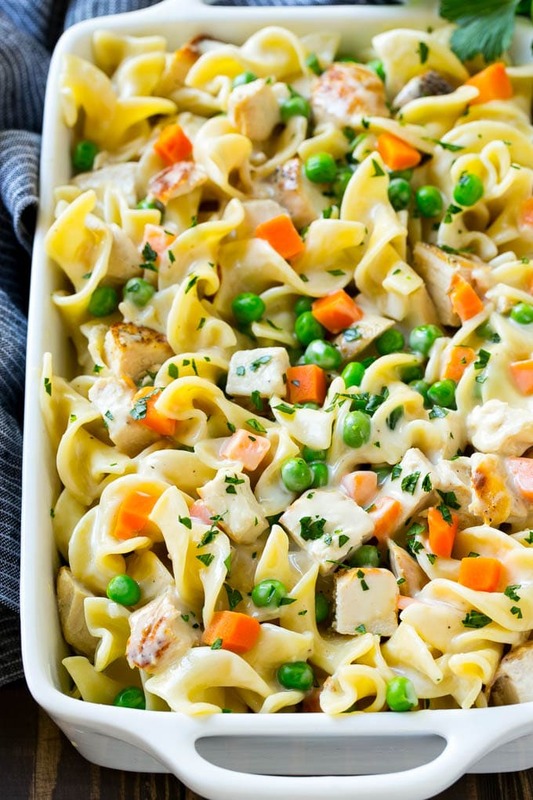 This chicken noodle casserole is comfort food at its finest, and it’s also super easy to make. My kids request this casserole all the time, it’s reminiscent of the flavors of classic chicken soup, but in a creamy casserole format. This casserole is also great for feeding a crowd! This recipe starts with cooked chicken, you can use leftover chicken, roasted chicken, rotisserie chicken, whatever you prefer. The chicken is mixed together with cooked egg noodles, frozen vegetables, seasonings, cream of chicken soup and cheddar cheese, then baked to perfection. I use extra wide egg noodles just because I feel like they hold up better texture wise in the casserole, but wide egg noodles will work too. For the veggies, I like to use a combination of frozen peas and carrots, but it actually wasn’t that easy to find that blend, I guess it’s not popular nowadays?! You can use any type of frozen veggie you like, a medley or frozen broccoli would also be great in this casserole. Yes, this recipe contains cream of chicken soup. I know a lot of people have issues with cream of soups, I use the heart healthy style here which is lower in fat and doesn’t contain MSG. If you don’t want to do cream of chicken soup, you could try making a homemade white sauce instead. 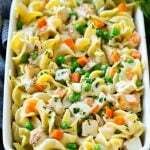 This chicken noodle casserole can be assembled up to 4 hours before you plan to serve it, simply store it in the fridge covered, then bake. You’ll want to add another 15-20 minutes to the bake time if it’s coming straight from the fridge. This casserole is a great way to get a quick and easy dinner on the table that your family will love, your kids might even eat the veggies! 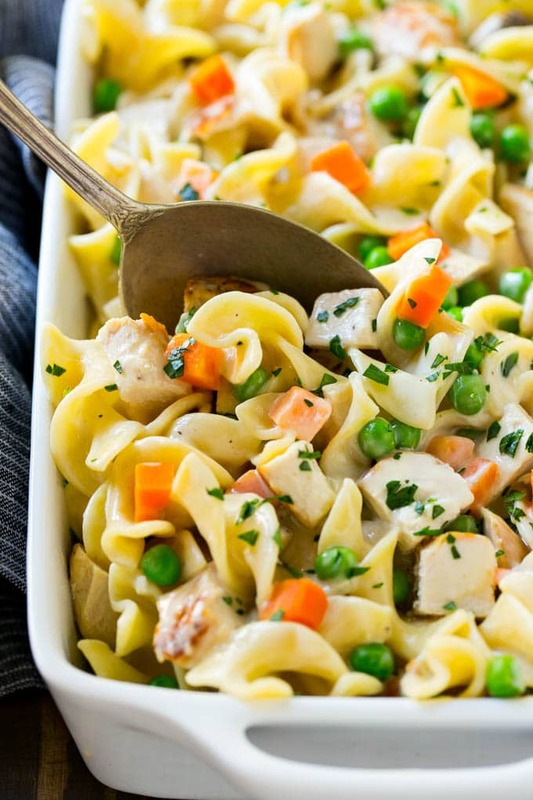 This easy chicken noodle casserole is a complete meal in one pan with chicken, veggies and egg noodles all together in a creamy sauce! Preheat the oven to 350 degrees F. Coat a 9"x13" pan with cooking spray. In a large bowl, combine the noodles, chicken, soup, milk, cheese, peas and carrots, garlic powder, onion powder and salt and pepper to taste. Place the noodle mixture in the prepared dish and cover with foil. Bake for 30 minutes or until heated through. Sprinkle with parsley and serve. This recipe is at least 60 years old. Just happy to see it still try to be learned. I am only in my early 30s and some of these comments amaze me. I did not have any milk so used 1/2 and 1/2 diluted with 1/2 water. Also replaced 1 can of Crm of Cx with 1 can of cream of celery. Delicious, husband loved it and it was such an easy clean up. My boy friend has a onion and garlic allergy so I used home made cream of chicken (2cp chikn broth, 1/4cp half+half,1/4cp cashw milk+4tbls corn starch wisked+cookd). I also used cashew milk for the cup of milk and I used 3/4 cup of cheddar and 1/2 cup mozzarella for the cheese. Small egg noodles. A lot of parsley, mixed in and on top. It turned out awesome! And super easy! Sounds great glad you enjoyed it! I’m wondering if I can make this ahead and freeze before baking? I’m due to have a baby soon and want to keep freezer friendly meal options available that I can just pop in the oven. I think it would work, just be aware that the noodles will soften upon freezing and being reheated! This was fantastic! I want sure how much four cups of chopped chicken was, so I only used 1lb of tenders, and cooled them up real quick (4 min per side) and copied them up. I didn’t feel like opening an extra package of noodles, so I only used 8oz of wider egg noodles, and subbed out one of the cream of chicken soup, for a 12 oz cream of mushroom, the result was a very steamy and extremely delicious dish! My kids LOVED it. Thanks for the recipe! This is becoming a staple in our house! So happy to hear everyone enjoyed it, thanks for reporting back! What happens if you toss the chicken in raw. Oops, don’t know where my head was. So sorry just seeing this now! I hope it came out ok for you, you’d have to bake it for a lot longer to make sure the chicken is cooked through. You could simmer the chicken, vegetables and soup mixture in a crock pot on low for 2 hours, then stir in cooked noodles at the end! Can you use canned chicken for this? Do you use diluted or undiluted cream of chicken soup? 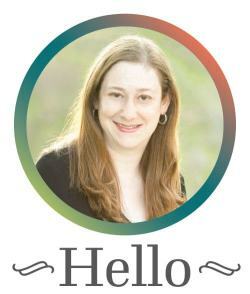 Hi…can I substitute Monterey Jack for cheddar ? Chicken noodle soup is a magic food, and transforming the classic dish into a casserole only amplifies its comforting effects. I specially like this. When i see your recipe, its sem to me watering mouth and took your recipe. Thanks. Is there any special way to cook the chicken if starting with raw chicken breast? You can roast it, saute it, whatever works best! Season with salt and pepper to taste! Sounds so good! Do you cook the frozen vegetables first, or just toss them in frozen? A noodle casserole plus with chicken sounds like a great recipe, Sara. Perfect combo of ingredients for a tasty dish. What kind of milk do you use for this recipe? I typically use 1% milk!